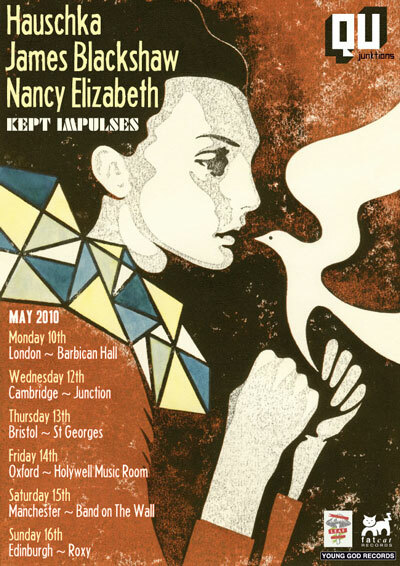 Nancy Elizabeth confirmed two tours in early 2010. January and February will see a string of solo shows encompassing the UK and Europe where she will be playing songs from recent album Wrought Iron. In May, a tour with 12-string guitarist James Blackshaw and prepared piano player Hauschka commences. Under the banner 'Kept Impulses', the dates begin with a prestigious show at the Barbican in London on May 10. As composers and performers all three effortlessly weave traditional folk and modern song into magical and transfixing musical suites. The 'Kept Impulses' tour quietly explores the waking dreams and hidden emotions that these acts draw upon. In the meantime, Nancy has one more show this year on Saturday 12 December. Taking place in Manchester at St. Margaret's Church, she will perform Wrought Iron in its entirety with a full 9-piece band assembled especially for this show. Following hot on the heels of the download/video ‘Swim' (which was Pitchfork.tv’s most viewed video this summer) comes another skewed slice of Oh No Ono’s cracking new album Eggs, the new single ‘Helplessly Young’. It’s everything we’ve come to love about Oh No Ono, and then some. All three videos can be found here. Eggs will be released digitally on January 18, with the full CD and vinyl release two weeks later on February 1. The band hit the road for a European tour in February, followed by a North American tour in March/April, including a visit to SXSW. You can expect to see them popping up on festival bills throughout next summer.